Acute cytomegalovirus (CMV) infection is a condition caused by a member of the herpes virus family. Most people come into contact with CMV in their lifetime. Typically only people with a weakened immune system become ill from CMV infection. 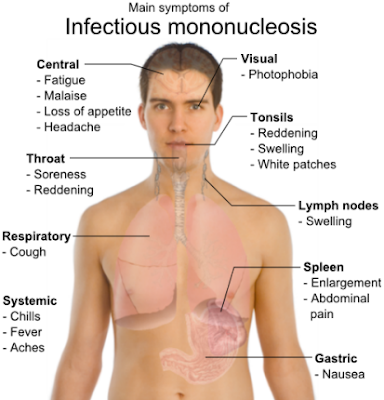 Some otherwise healthy people with acute CMV infection develop a mononucleosis-like syndrome. In the United States, CMV infection most commonly develops between ages 10 and 35. Many people are exposed to CMV early in life but do not realize it because they have no symptoms, or they have mild symptoms that resemble the common cold. People with a compromised immune system can have a more severe form of the disease. CMV is a type of herpes virus. The virus remains in your body for the rest of your life. If your immune system becomes weakened in the future, this virus may have the chance to reactivate, causing symptoms. Your health care provider will perform a physical exam and feel your belly area. Your liver and spleen may be tender when they are gently pressed (palpated). You may have a skin rash. Special lab tests such as a CMV DNA serum PCR test may be done to check for substances in your blood that are produced by CMV. Other tests such as a CMV antibody test may be done to check your body’s response to the CMV infection. CMV infection can be contagious if the infected person comes in close or intimate contact with another person. You should avoid kissing and sexual contact with an infected person. The virus may also spread among young children in day care settings. When planning blood transfusions or organ transplants, the CMV status of the donor can be checked to avoid passing CMV to a recipient who has not had CMV infection. Symptomatic Homeopathy medicines helps for cytomegalovirus,. It’s good to consult a experienced Homeopathy physician.